She therefore "knows nothing Jon Snow"
Unless that is her speculation - which is weird because Anakin is actually more powerful than any jedi that ever lived - he just never reached that point in his training to unleash that raw power - he was freakin conceived from the force - he is like jesus! So Daisy making a bold claim like that is rather strange to say the least. Tomorrow the embargo stops so get ready for spoilers to be everywhere! Yesterday was the premiere for the last Jedi but the movie doesn't come to the theatre until Friday... I was wondering who gets invited to movie premieres and what is that all about? I can't see the new movie until the 20th at least. Will there be any in-game spoiler content released before that? I've been trying to avoid everything before I watch the film, should I avoid SWGOH? The game should be safe. Lucas films has been doing everything to keep things under wraps. Seems Luke might not make it in this movie. The first part of the movie was great, the drama and the bombers. The rest of the movie was a toss up for me. The chewy scene with the furry creatures was funny, the yoda scene was great, the new AT-M6 walkers were cool. It was also neat that they put a regular ATAT beside the AT-M6 to show how much bigger they were. Kylo Ren as the new leader of the first order is a bit meh to me. It leaves a bitter taste in my darkside mouth now that Snoke is dead because who will Capital games now make as a darkside toon to compete against CLS and Jedi Training Rey? Hopefully not another Josh Groban toon. Yoda scene is BY FAR, my favourite of all the 3 sagas. It brought tears to my eyes! But with peace on his on choice. And all the Snoke and Rey‘s parents theories. I liked tho movie but my feelings are confused, I need a secondo look.. I understand the idea that things must move forward and we cannot continue forever in a celebration of our old heroes and flavours; I found interesting the way they designed Kylo: at the same time he is a stupid teenager and also a credible evil, with conflicts inside himself. I appreciated that after killin Han Solo in episode VII (what a pain!) he now kills Snoke to become the leader as himself. Snoke is simply nothing special: really? Rey's parents are dead and were nothing special: really? Rey is not linked at all to the Skywalker family not to other great character of the past: really? I understand the sense: they want to explain that the Force is in everybody (the baby in the last scene...), so it does not need anymore a powerful Jedi Master and similar.... so Rey... was she chosen by the Force in a totally random way? 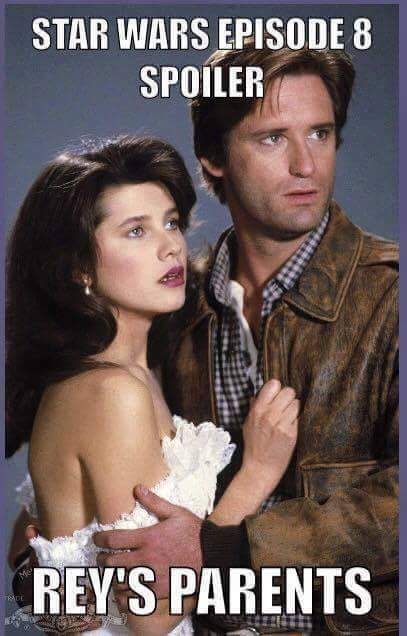 And what the hell was that Leia scene, i mean what ....... The scene was beautiful and it was a peaceful and poignant way for Leia to leave the saga..... but then that happens and it instantly became cringey and unbelievable. 1. in the heir to the empire, luke fails to use the mind trick and gives up though, commenting on his lack of knowledge and then the situation solves itself. while rey basically retries and manages to perform it. 2. luke skywalker was dubbed "the greatest bush pilot in the outer rim", he wasn't a no body. guess who haven't watched the director's cut edition. he was already a master of t-16 sky hopper which was produced by the same company that designed the x-wings. 3. learning to fix or fly ships by scavenging them is the most far-fetched explanation i have ever heard. it defies logic. If he was so good at fixing highly modified ships and then flying them, why did she live like rats and scavenged for a rations? what am i missing here, technical expertise means a lot in a backwater planet. and Luke wasn't a "great fixer" on the contrary han solo openly mocked his lack of experience in hyperdrives. 4. rey is perfect, while luke was a pushover among his friends and a foolish little boy who thought only way out of the dust planet was joining an EMPIRE ACADEMY. luke had major flaws which he overcame eventually. 5. "was still a trainee" this is a logical fallacy, being a trainee does not imply incompetence. darth maul was still deemed an apprentice by sidious when he trashed qui-gon who was also a force powerhouse. 6. obi-wan kenobi was not a powerful force user, he was average at best. but through great effort & intelligence he was able to match the naturally gifted. 7. bowcasters are the shotguns of the SW universe, it shouldn't be able to deal a critical blow at that range.he wasn't SERIOUSLY injured. besides dark side users subsist on suffering, pain and rage. that wound should have empowered him. still a wound shouldn't be an excuse for someone who has been trained by grandmasters since he was kid. 8. kylo or snoke are not SITH. 9. getting abilities/skills "matrixed" into your brain is the most non-starwars thing ever. star wars is all about training, skill and talent. leia organa is the twin-sister of luke, she is also force sensitive but due to her lack of training she could have never used the force. what makes rey special? 10. and you are not really proving anything, you are just justifying her being a mary sue by saying every SW protagonist were, while luke is the exact opposite of a marry sue. and judging by the events in the newest movie Rey is even more powerful than Yoda. rey is a marry sue sorry. What do you all think, marquee? legendary? straight into shops? Check it out. Could this be today’s content update? Think I’m reading this post right. If they ever drop the update! New marquee events, most likely. Hux confirmed, though? If you read all the other bits it's all repeated. I think those characters are in different games in the list, not this one. I would like all those toons in GoH though. And a new attacker Poe.